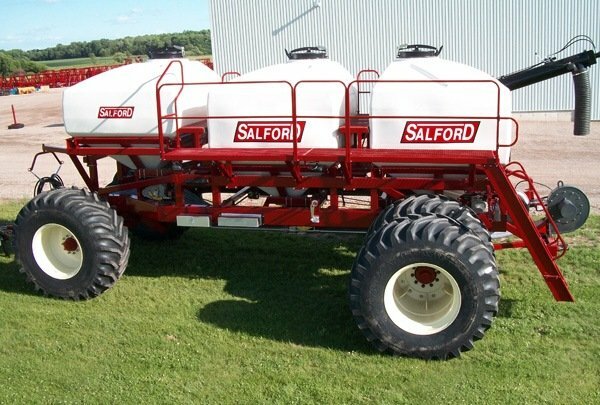 Salford Air Carts feature poly tanks with stainless steel metering systems for fast easy cleanout and the ability to hold seed or fertilizer without degradation of the tank. The AC3000 is a tripple tank, tow-between or tow-behind model. The AC3000 can also be equipped with the optional Salford Plus tank, adding an extra 65bu tank for small seed application. The AC3000 comes standard with a 17" REM® fan, 10 outlet meters, and a Zero Max® infinitively adjustable ground drive. Salford's stainless steel meters use a poly peg roller for accurate meeting of almost any commodity at virtually any rate. Individual metering compartments ensure that the same amount of product is delivered to each run for highly accurate application rates.